Rick Scott campaigned on standing up for Puerto Rico. 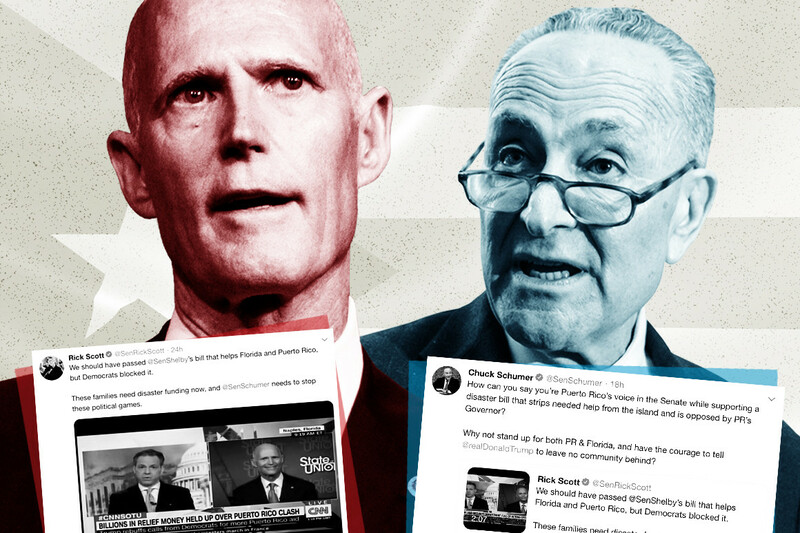 But with President Donald Trump warning senators not to provide more aid to the island, the Florida Republican is caught between his party and his promises. And Democrats are eager to exploit that tension — blasting Scott for sticking with the president on a critical disaster relief bill and throwing the freshman senator into the middle of a broader fight over stalled assistance for millions of Americans devastated by wildfires, flooding and hurricanes. Scott, meanwhile, is lashing out at his Democratic critics, feuding in particular with Senate Minority Leader Chuck Schumer (D-N.Y.) in increasingly personal terms. I’m working with Rs, Ds and the President to get a deal done. But it shouldn’t have taken this long. FL’s been waiting 6 months. The disaster aid bill serves as a first crucial test for the former Florida governor, who campaigned in 2018 as an advocate for Puerto Rico and someone willing to split with Trump. During his successful campaign against incumbent Sen. Bill Nelson (D-Fla.), Scott said he disagreed with Trump’s baseless suggestion that Democrats inflated the number of people who died from Hurricane Maria. Scott cited his comments, made on Twitter, in a Spanish-language commercial. According to sources who track media buying, Scott spent $4.7 million on Spanish-language TV and radio during his campaign. After his narrow victory, Scott delivered a floor speech in which he said he intends to be a “voice for the people of Puerto Rico” in the Senate and offered an amendment to provide disaster aid to Puerto Rico as part of legislation to end the government shutdown. The amendment went nowhere during the shutdown, and Democrats scoff at his claim to be a champion for the struggling territory. “If you wanna be an advocate you need to be an advocate, which means you should be advocating for Puerto Rico which is not what he’s doing,” said Sen. Robert Menendez (D-N.J.). When asked about his response to Democratic criticism, Scott went after Schumer in a brief interview last week. “Who voted for Shelby’s disaster bill, who voted against it? It was pretty simple,” Scott said, referring to a Republican-backed proposal from Senate Appropriations Chairman Richard Shelby (R-Ala.). Competing measures to provide disaster relief failed to advance earlier this month. One plan, from Sen. David Perdue (R-Ga.) and Shelby, would have provided $600 million in nutrition assistance to Puerto Rico, as well as money to the Midwest, which has been hit by recent floods. A Democratic alternative proposed by Senate Appropriations Ranking Member Patrick Leahy (D-Vt.) and Schumer would have provided similar nutrition assistance to Puerto Rico while freeing up grant funding from the Department of Housing and Urban Development that has already been allocated to the island; it also would have increased eligibility for disaster relief in Midwestern states and Southern states affected by floods. The GOP proposal failed to get the 60 votes need to advance, as did a House Democratic bill; Senate Democrats sought to bring their plan to the floor by unanimous consent but were blocked by Republicans. Democrats blame Trump, who recently complained behind closed doors to Republican senators that Puerto Rico was getting too much disaster aid and that the island was misusing federal hurricane relief. McConnell described Shelby’s bill as “the only game in town” on the Senate floor earlier this month, and Republicans say that Trump is all but guaranteed to veto legislation that includes more money for Puerto Rico. “He’s pretty upset about how much money Puerto Rico’s gotten relative to other places where there’s been serious disasters,” said Sen. John Cornyn (R-Texas). In addition to meeting with the White House and proposing the disaster aid amendment during the shutdown, Scott traveled to Puerto Rico in February and met with Puerto Rico Gov. Ricardo Rosselló later that month. Rosselló opposes the Republicans’ disaster aid bill and has called for more money from Congress. Scott’s discussions with the White House come amid low approval ratings for Trump among Puerto Ricans in Florida, according to a recent survey. The survey found that only 21 percent of Puerto Rican in Florida voters had a positive opinion of Trump, while 69 percent had an unfavorable opinion. Scott, by contrast, had a 48 percent favorability rating and a 35 percent unfavorability rating. It’s not unheard of for a freshman senator to attack another party’s leader. But Scott also clearly has no problem with trying to seize the spotlight. The former governor occasionally holds solo news conferences on a range of issues, from Washington dysfunction to Venezuelan politics. But Rubio was more open about his disagreement with the White House.